Bromelain is a mixture of enzymes found naturally in the juice and stems of the pineapple plant (Ananas comosus). Available in dietary supplement form, bromelain is considered a proteolytic enzyme, a class of enzymes thought to aid in the digestion of protein. Bromelain supplements are said to treat a variety of health conditions, especially those associated with chronic inflammation, such as allergies, osteoarthritis, sinusitis, and ulcerative colitis. Bromelain is also said to stimulate digestion and improve heart health, as well as protect against some forms of cancer. The medicinal qualities of pineapple are recognized in many traditions in South America, China, and Southeast Asia. According to the National Center for Complementary and Integrative Health (NCCIH), the best evidence for bromelain relates to the relief of symptoms of acute nasal and sinus inflammation when used in combination with standard medications. Research for other benefits for which bromelain has been used is either conflicting (osteoarthritis and muscle soreness after exercise) or lacking (cancer and gastrointestinal problems). Numerous studies have documented the benefits of bromelain for sinusitis. In one double-blind trial from 1967, 60 patients with moderately severe to severe sinusitis received bromelain or placebo, along with standard therapy, for six days. Researchers found inflammation was reduced in 83 percent of patients taking bromelain compared to just more than half of the placebo group, and breathing difficulty was relieved 78 percent in the bromelain group compared to 68 percent of the placebo group. More recently, a 2006 review of 10 randomized control trials reported that, when used with standard medications, bromelain can help relieve sinus inflammation. A pilot study of 12 patients with chronic sinusitis published in 2013 found that taking 500 milligrams of bromelain six times a day for three months improved symptoms and quality of life. Finally, a 2016 review of review of studies reported that bromelain may shorten the duration of acute sinusitis symptoms in children, improve breathing, and reduce nasal inflammation. Laboratory studies show that bromelain reduces the levels of some substances that cause inflammation from arthritis, but results from clinical trials are mixed. Studies that investigated bromelain to ease the pain following episiotomies (surgical cuts in the perineum) during childbirth also show mixed results. Bromelain has provided relief in nasal and foot surgery, though the studies are dated, as well as dental surgery. So far, studies testing bromelain's effects on knee pain have yielded mixed results. In a small study published in QJM: Monthly Journal of the Association of Physicians in 2006, for example, bromelain supplements appeared to be no more effective than a placebo in alleviating symptoms such as pain and stiffness in people with osteoarthritis of the knee. The 12-week study involved 47 patients with moderate to severe knee osteoarthritis. Conversely, in a 2006 review published in the journal Arthritis Research & Therapy, investigators analyzed nine clinical trials on the use of bromelain for treatment of osteoarthritis pain. Seven of those trials found bromelain was at least as effective as diclofenac, a non-steroidal anti-inflammatory drug often prescribed for osteoarthritis, while the other two trials found bromelain to be no more effective than placebo. Other research shows that bromelain may ease knee pain in people without arthritis. This includes a small study published in Phytomedicine in 2002. In their analysis of data on 77 otherwise healthy adults with mild acute knee pain, the study's authors found that one month of treatment with bromelain significantly relieved symptoms and improved physical function. Oral bromelain has been found to be effective in reducing pain, swelling, and healing time following surgery. However, its actions have been found to vary in different persons and different tissues in the same person. When bromelain was given to 40 patients following oral surgery in a 2016 study, 70 percent of patients experienced a reduction in swelling and pain. Researchers recommended a daily dosage between 750 milligrams and 1000 milligrams a day in divided doses to be taken before eating. A mouse-based study published in Clinical Immunology in 2005 indicates that bromelain may aid in the treatment of inflammatory bowel disease (IBD). The study determined that bromelain may help suppress IBD-related inflammation. In another study, published in 2008, researchers exposed colon biopsies from patients with ulcerative colitis and Crohn's disease to bromelain. 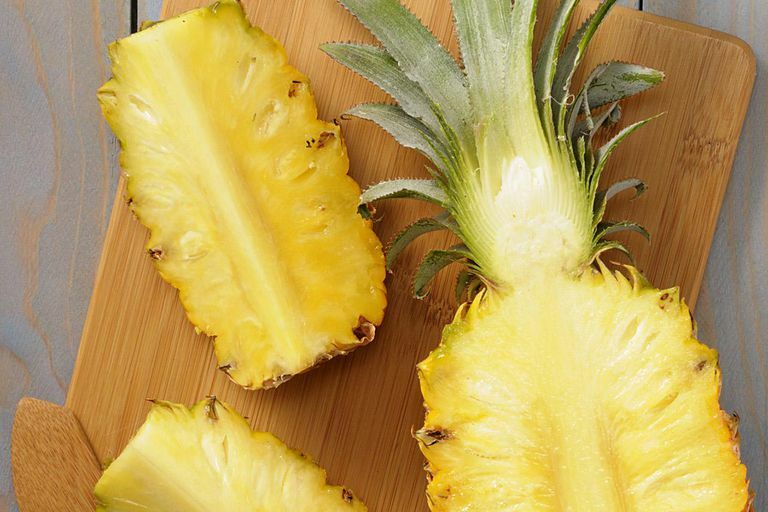 They reported that bromelain reduced production of several pro-inflammatory cytokines and chemokines (cell-signaling proteins) that are elevated in IBD and play a role in its progression. There is a case report of two patients with ulcerative colitis who responded well to treatment with bromelain, however, bromelain has not been tested rigorously in either animals or humans with IBD. Further studies are needed to see if similar changes also occur when colon tissues are exposed to bromelain inside the body. Bromelain shows promise in the treatment of asthma, according to a preliminary study published in Alternative Therapies in Health and Medicine in 2012. In tests on mice, researchers observed that treatment with bromelain may inhibit asthma-related airway inflammation. Some preliminary research suggests that bromelain may possess anti-cancer properties, but these effects haven't been confirmed in humans. In a study published in the Journal of Medicinal Food in 2012, for instance, tests on breast cancer cells demonstrated that bromelain may fight breast cancer by inducing apoptosis, a type of programmed cell death essential for stopping the proliferation of cancer cells. In a study in 2007, bromelain treatment increased the survival index of animals with leukemia, lung, breast, sarcoma (bone and soft tissue), and ascetic tumors. According to the Memorial Sloan Kettering Cancer Center, it may be useful as an adjuvant in cancer treatments. Bromelain has been investigated for its debriding effects on burn wounds. A review of clinical findings reported that topical bromelain preparations may help remove dead skin from burns. However, not enough evidence exists to show whether topical bromelain helps to treat these or other wounds. Bromelain supplements are sold as powders, creams, tablets or capsules, which may be used alone or in combination with other ingredients. There is no standard dosage of bromelain. Taking 200 milligrams (mg) to 400 mg three times a day on an empty stomach is often recommended. For children, halve this dosage. When used as a digestive aid, bromelain is usually taken with meals. When used for inflammatory conditions, it's often taken between meals on an empty stomach in order to maximize absorption. Side effects commonly associated with bromelain include abnormal uterine bleeding, diarrhea, drowsiness, heavy menstruation, increased heart rate, indigestion, nausea, and vomiting. In some people, bromelain may trigger allergic reactions and asthma symptoms, such as breathing problems, tightness in the throat, hives, rash, and itchy skin. People with allergies to pineapples should avoid bromelain. Allergic reactions may also occur in people with allergies to latex, carrot, celery, fennel, rye, wheat, papain, bee venom, or grass, birch, or cypress pollens. In addition, pregnant women and people with peptic ulcers should not use bromelain. Those with other digestive disorders should consult their physicians before taking bromelain supplements. Bromelain may increase the risk of bleeding and should also be avoided prior to undergoing surgery. Bromelain may be harmful to people with bleeding disorders and people taking blood-thinning (anticoagulant or anti-platelet) medication or supplements such as aspirin, Coumadin (warfarin), or ginkgo biloba. It should also be noted that avoiding or delaying standard care and self-treating a chronic condition with bromelain supplements may have serious consequences. Talk to your doctor if you're thinking of using bromelain for any condition. Ameye LG, Chee WS. Osteoarthritis and nutrition. From nutraceuticals to functional foods: a systematic review of the scientific evidence. Arthritis Res Ther. 2006;8(4): R127. Baez R, Lopes MT, Salas CE, Hernandez M. In vivo antitumoral activity of stem pineapple (Ananas comosus) bromelain. Planta Med. 2007 Oct;73(13):1377-83. Braun JM, Schneider B, Beuth HJ. Therapeutic use, efficiency and safety of the proteolytic pineapple enzyme Bromelain-POS in children with acute sinusitis in Germany. In Vivo. 2005;19:417–421. Brien S1, Lewith G, Walker AF, Middleton R, Prescott P, Bundy R. Bromelain as an adjunctive treatment for moderate-to-severe osteoarthritis of the knee: a randomized placebo-controlled pilot study. QJM. 2006 Dec;99(12):841-50. Buttner L, et al. Efficacy and tolerability of bromelain in patients with chronic rhinosinusitis—a pilot study. B-ENT. 2013;9(3):217-25. Chobotova K1, Vernallis AB, Majid FA. Bromelain's activity and potential as an anti-cancer agent: Current evidence and perspectives. Cancer Lett. 2010 Apr 28;290(2):148-56. Dhandayuthapani S1, Perez HD, Paroulek A, Chinnakkannu P, Kandalam U, Jaffe M, Rathinavelu A. Bromelain-induced apoptosis in GI-101A breast cancer cells. J Med Food. 2012 Apr;15(4):344-9. Hale LP1, Greer PK, Trinh CT, Gottfried MR. Treatment with oral bromelain decreases colonic inflammation in the IL-10-deficient murine model of inflammatory bowel disease. Clin Immunol. 2005 Aug;116(2):135-42. Memorial Sloan Kettering Cancer Center. Bromelain. National Center for Complementary and Integrative Health. Bromelain. Onken JE, Greer PK, Calingart B, Hale LP. Bromelain treatment decreases secretion of pro-inflammatory cytokines and chemokines by colon biopsies in vitro. Clin Immunol. 2008 Mar;126(3):345-52. Epub 2007 Dec 21. Pavan R1, Jain S, Shraddha, Kumar A. Properties and therapeutic application of bromelain: a review. Biotechnol Res Int. 2012;2012:976203. Rathnavelu Vidhya, et al. Potential role of bromelain in clinical and therapeutic applications. Biomed Rep. 2016 Sep; 5(3): 283–288. Rosenberg L, Shoham Y, Krieger Y, et al. Minimally invasive burn care: a review of seven clinical studies of rapid and selective debridement using a bromelain-based debriding enzyme (Nexobrid). Ann Burns Fire Disasters. 2015 Dec 31;28(4):264-274. Ryan RE. A double-blind clinical evaluation of bromelains in the treatment of acute sinusitis. Headache. 1967;7:13-17. Secor ER Jr1, Shah SJ, Guernsey LA, Schramm CM, Thrall RS. Bromelain limits airway inflammation in an ovalbumin-induced murine model of established asthma. Altern Ther Health Med. 2012 Sep-Oct;18(5):9-17. Tejpal Singh, Vinayak More, Umayra Fatima, Tanveer Karpe, Mohammed A. Aleem, J. Prameela. Effect of proteolytic enzyme bromelain on pain and swelling after removal of third molars. J Int Soc Prev Community Dent. 2016 Dec; 6(Suppl 3): S197–S204. Walker AF1, Bundy R, Hicks SM, Middleton RW. Bromelain reduces mild acute knee pain and improves well-being in a dose-dependent fashion in an open study of otherwise healthy adults. Phytomedicine. 2002 Dec;9(8):681-6.